Mobile Locksmith was founded by John H. Blackburn Sr. in 1968 in West Taghkanic, New York. At the time, it was called A Country Lock Shop. It was one man, one van. After moving to Gainesville, Florida, with his wife in 1979, John H. Blackburn Sr. reopened his business as Mobile Locksmith, earning a reputation as an honest and dependable choice for residents of Gainesville and the surrounding areas. In 1983 and with the business growing, John H. Blackburn Sr. convinced his son John H. Blackburn II to not reenlist in the United States Marine Corps and to come to Gainesville and begin growing a family business: two men, one van. Our company has grown significantly, opening a location on Archer Road, running as many as five dispatched units at a time, and showing Gainesville the value of hard work and years of experience. Since the beginning, Mobile Locksmith has been about integrity, craftsmanship, and the old-fashioned notion of the American Dream. Our staff is made up of knowledgeable professionals — each with their own specialty and expertise. All of our staff members are qualified in general locksmithing, and they can meet all of your commercial and residential locksmith needs. 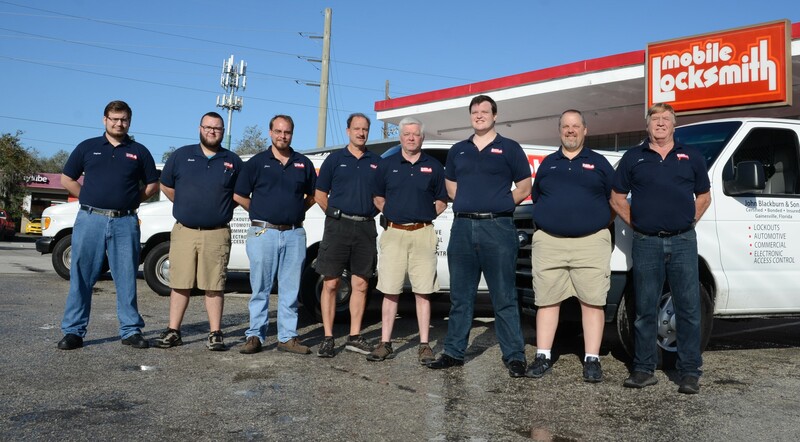 From left to right: Peyton, Jacob, James, Allan, Rick, John III, George, and John II make up our team of professionals ready to take on any challenge. Since 2001, we have been located at the fork of Archer Road and SW 16th Avenue. Our original shop was located in Archer Square at 3511 SW Archer Road (where Kohl's is currently). It opened in 1986. Our shop contains over 90,000 key blanks! When Gainesville hardware stores can't find the key you have, they will usually send you our way. If you take your locks off your house yourself and bring them into our shop, you can save yourself a service call fee! 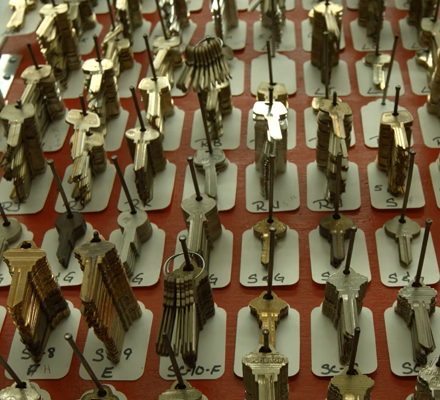 If you bring your antique locks into the shop, we are often able to help find or make keys for them. If you buy a new lock from us, we rekey it to your existing key for free. We unlock over 1000 cars per year.